While NordVPN is quite reasonably priced, at rates most users can easily afford, there is nothing wrong with wanting a deal. The current working NordVPN coupon code is “70off ” for their 1 year plan. They are also running a 2 year deal when their 3 year deal ends. NordVPN coupons are everywhere on the internet, including Reddit, Google search results, and even in banner ads on some of your favorite websites. However, most of these codes are fake. Sifting through pages of fake codes in search of one that works can be time-consuming and, ultimately, discouraging. Learn how to find real discount codes and how to distinguish them from fake ones to save time, money, and your sense of sanity. Why All the NordVPN Coupon Fakes? There are a few reasons for so many fake codes out there. One of the biggest is affiliation. A website may reach a deal with the company, offering a link to a NordVPN coupon code. When a user clicks on the link and uses the code, both Nord VPN and the website earn money. It helps consumers save money, attracts customers to the VPN, and earns the website a bit of money. It’s a great system when it works properly. The problem lies in companies that act disreputably. Dishonest advertising practices often include a bait and switch, where ads on Google and Reddit offer inflated discounts, promising to save users 80 or even 90 percent. Once a person clicks on the link and is directed to the site, they discover that the discount is much less. In other cases, the website doesn’t give a fake code, but instead uses a fake URL. Users who click the link are directed to NordVPN’s site but are not given any discount. A second reason for the prevalence of broken codes is that even legitimate ones expire. Some websites collect discount codes, compiling them into lists for the convenience of their readers. Since each code expires, eventually the entire list is going to be out of date. Unfortunately, many websites do not remove this kind of content, resulting in numerous broken or expired NordVPN coupon codes being found online. Thankfully, there are a few easy ways you can determine if a NordVPN coupon is fake or legitimate. For starters, ask yourself if the offer is too good to be true. There is practically no chance of you finding a 90 percent off coupon for two years worth of services, for example. Clearly, this offer is fake. Secondly, determine what the cost of the coupon is. Do you have to pay a fee to a website before you can see the code? Do you have to go through an extraordinary amount of effort to activate it? In cases like these, the coupon is almost always fake. While you can buy coupons on auction sites like eBay, most VPN coupons are not sold this way. Finally, you can Google it. Use the coupon’s name and discount, or any other identifying piece of information about the coupon, along with the word “fake” to read more from others who have tried the code in the past. Another easy way to tell if a code is likely to still be active is to look at the date it was posted. An article containing a list of NordVPN coupon codes from 2016 is not likely going to still be valid. However, one posted a week ago may still have unexpired codes on it. Finally, you should always be sure you only click links and view codes posted on reputable websites. Many unscrupulous websites trick users into a click that ultimately installs malware or bring up unrelated, spammy content. You can avoid these types of websites by reading other pages. Look for content related to VPNs, privacy, and security. Spam websites tend to have no other content, be poorly put together, and poorly written. 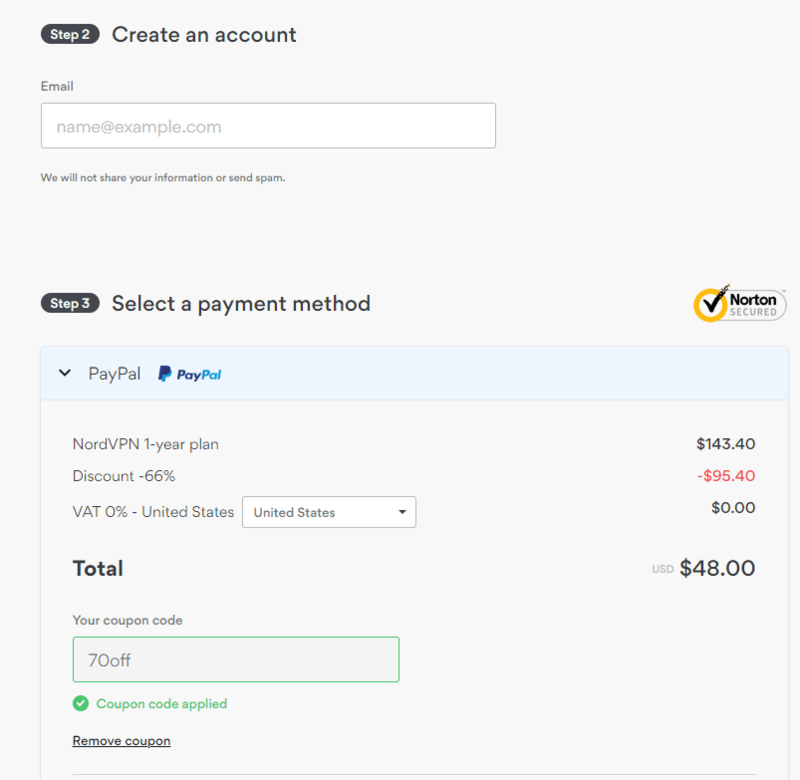 There are ways you can combine coupon codes with NordVPN’s existing pricing structure to get the best possible deal. At the moment, the company offers four tiers of plans: one month, one year, two year, and three year. If you use a valid coupon and combine it with the three-year plan, you can find a ton of savings. With this option, you can benefit from all that their services have to offer for less than the price of one cup of coffee per month. If you are reluctant to spend any money on a service you have not tried, NordVPN has a solution. Even if you use a coupon, you are still eligible for their 30-day refund window. If you are, in any way, dissatisfied with the product, you can get your money back at the end of the 30-day period. This gives you a chance to try out the program without any long-term commitment. With the growing number of ISPs that are gathering data about your browsing habits, it has never been a better time to get a VPN. Looking for a NordVPN coupon code is the best way to start using these services without investing too heavily in a new product. 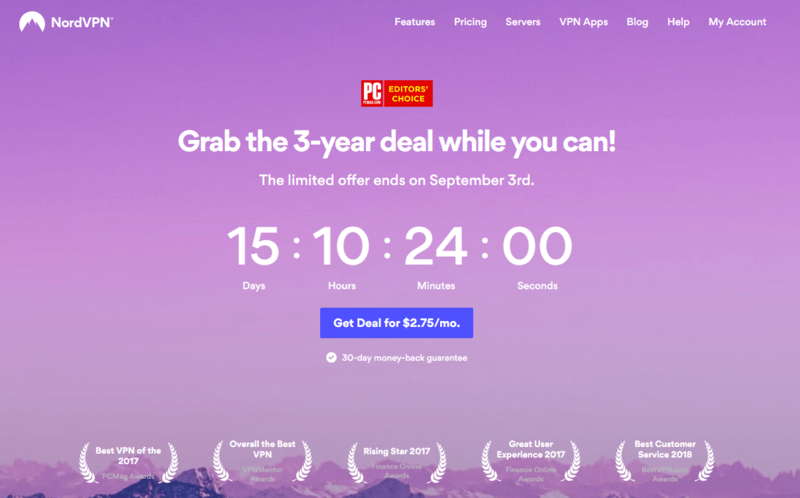 NordVPN is currently running a great discount deal at $2.99 for a limited time on their 3-year plan. That’s a 75% discount! You save a lot compared to the normal retail price! You don’t need a special NordVPN discount coupon code for this deal. Just use the link below to visit their sales page and signup for their 3-year plan. We are currently listing NordVPN as our top rated VPN service for 2019. You can read all about them and why we like them in our NordVPN review. Don’t hesitate to grab that NordVPN discount deal while it’s still running! 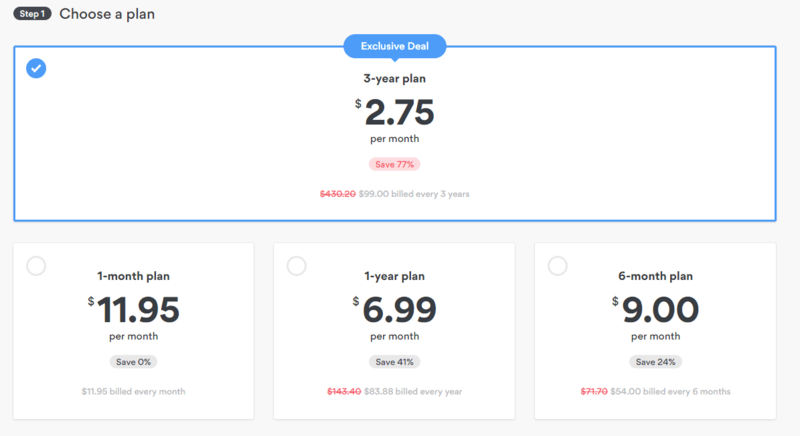 Save 75% on the 3-year plan ($2.99 per month) and fully refundable for 30 days. Psst! There actually is a NordVPN promo code for their 1-year plan! Apply discount code 70off in order to reduce the price by $95.40! Just click the “Got coupon” link when selecting payment method in order to apply the coupon. Now, use that NordVPN coupon code and enjoy your subscription a cheap price!